This is another Sanso print done for the owner. It is a landscape with calligraphy by the Japanese painter Murase, Taiitsu. No copying, reproduction or other dissemination of this photo and artwork is permitted without the express written permission of the owner. This link provides a short synopisis of this artist. http://oxfordindex.oup.com/view/10.1093/gao/9781884446054.article.T060446. The scroll was made in the Maru Hyougu format. The cloth is a beautiful light blue with white crackle. The Ichimonji was requested with a larger width than usual. It is a deep gold with pine needle motif. The scroll is finished in with the takuboku style hanging string and an resin jikusaki that mimics the look of real ivory. If you have a painting you would like mounted or remounted, please contact to sales@customjapanesecalligraphy.com or visit my website at www.customjapanesecalligraphy.com to obtain more information. This scroll was made for the previous owner of the Sanso Collection. All rights belong to the owner and no copying or dissemination of this photo is permitted without express written consent by the owner. Below is a short bio from Wikipedia. Kanō Tan'yū (狩野 探幽, 4 March 1602 – 4 November 1674) was one of the foremost Japanese painters of the Kanō school. His original given name was Morinobu; he was the eldest son of Kanō Takanobu and grandson of Kanō Eitoku. Many of the most famous and widely known Kanō works today are by Tan'yū. 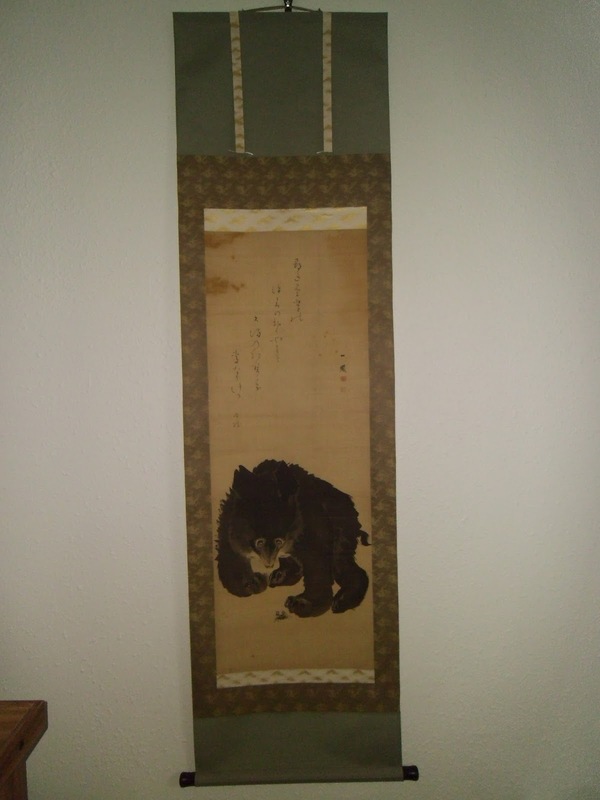 This scroll is mounted in the Yamato Hyougu style. The Brown cloth is a pure silk (正絹). The blue Kinran helps to reinforce the night time scene, with the brown cloth giving wind and the tan cloth. The scroll utilizes a Two Tone copper ceramic jikusaki. This picture is posted with the permission of the owner. No copying, dissemination, or downloading is prohibited without the express written permission of the onwer. This is the painting of a plum branch by Buson. This information about the artist Yosa Buson, is quoted from the Encyclopedia Britannica. "Buson, also called Yosa Buson, original surname Taniguchi, (born 1716, Kema, Settsu Province, Japan-Died Jan. 17, 1784, Kyoto Japan), Japanese painter of distinction but even more renowned as one of the great haiku poets. It is very beautiful, and I love the ambiance of the painting. The scroll was made in a simpler, Minchou Hyougu style. There is a thin, blue accent running the lengths of both sides of the scroll, which are not so evident in this picture. The light brown, cloth works with the brushes of the painting. 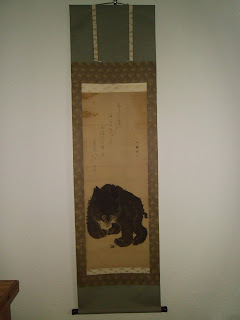 The scroll is finished with an ivory (resin made to look like real ivory) jikusaki and the Kodai San Iro hanging string. This is a yoji jukugo 四字熟語 which is a four character idiom in Japanese that has significant meaning. Ten 天 is Heaven, Ka 下 is Below, Mu 無 is None, and Sou 双 is a pair. In short it can mean Peerless Under Heaven. In other words, no one on this earth can match you. If someone has a special gift or indomitable spirit in a certain aspect of their life this is a very appropriate phrase to use. The customer who ordered this is giving it to a special person, who overcame great obstacles to accomplish something good in their life. If you would like to have a custom Kakejiku or wallscroll made for yourself or a gift for someone else, please contact to sales@customjapanesecalligraphy.com Also, please visit our site and blog to see what others have commissioned in the past. This is a different display using a similar painting of Canyon deChelley. The customer chose these cloths based upon a previous scroll done for a bonsai artist. The bonsai are entirely different from the display at USNBE. 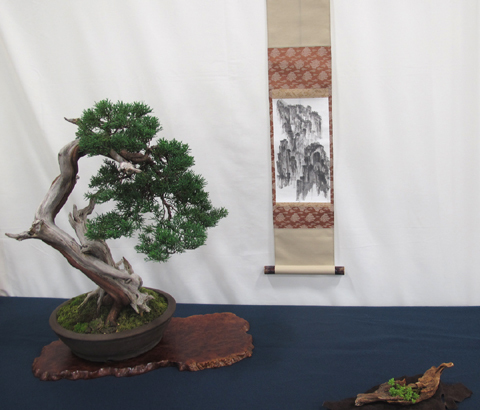 This scroll was made for a bonsai artist that submitted their tree to the 2018 US National Bonsai Exhibition. 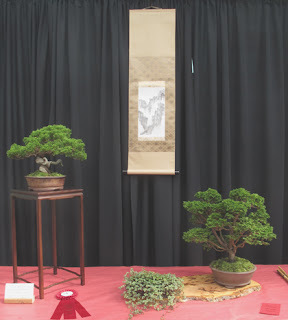 (2018 USNBE) The USNBE is put on by Bill Valvanis, one of the premier bonsai artist's in the US. The bonsai artist that owns this tree sent me two Sumi she had done of some scenes inspired by Canyon de Chelly in Arizona. This area is located on Navajo lands. As a result I wanted to use cloths and symbolism for this area in the mounting. The red chuumawashi (intermediate) cloth has a phoenix motif, but felt it would also translate into the Navajo legend of the thunderbird. The red color is also muted to match the sandstone in the area as well. It is hard to see, but the jikusaki are ceramic with deep earth brown and streaks of red to match the intermediate cloth. The light golds of the ichimonji and Ten/Chi were also used to accentuate the colors you would see in this geographical location. This particular customer wanted the phrase 四神 Shijin written in the Kaisho style. Shijin in classical Chinese are four animals that guard the four compass points. In Japanese it is typically associated with the Buddhist Shitennou. This customer requested a light green cloth. So I used a solid with a rich brown Kinran for the ichimonji to symbolize Earth and greenery. The scroll is completed with a green (鶯）hanging string and plastic ivory jikusaki.
. I used the concepts of 寒色・暖色 (Kanshoku/Danshoku), which means cool colors/warm colors respectively. The waterfall is a summer theme motif in Japanese art. In mounting, a common technique is to use colors of the opposite season. So if it is hot in summer, you want to use cool colors to affect the viewer positively with the opposite feeling of the color. What I love with this painting is the small birds flying across the waterfall. It really brings this painting to life. Sometimes I have had difficulty with uki after applying the urauchi while working with silk paintings. However this one turned out close to perfect. This scroll is for sale for $250.00 and will include a Paper box. For inquiries of purchase please contact to sales@customjapanesecalligraphy.com. Makimono scrolls completed with the help of my teacher in Japan. I learned some new techniques and skills while in Japan. It makes me realize, the more I learn the less I know. In Japanese there is a proverb read 初心を忘れるべからず, (shoshin wo wasureru bekarazu) which reminds one to never forget the spirit and gumption they had when embarking on learning a new skill, career etc. This is for a Martial Artist who is giving to a student that achieved the dan ranking. We wrote slightly differently to have all characters, but the meaning is essentially the same. This was a reminder to me that in my Hyousou arts, I should rekindle that inner spark. This kakejiku was commissioned as a gift. The customer wanted us to write the Way of Logic. We translated it as Ronridou. It was made in the three step style. The Red/Rose color cloths complement well with the khaki ten/chi. I had a customer that I worked with many years ago send me a scroll he had damaged cutting it with a knife. I took it apart and remounted the entire scroll. I am not a good cameraman and my camera is very low quality. If you want to see how beautiful this frame job was, you would need to see it in person. Hopefully the bonsaiist will display it with a tree. The scroll is finished with a gold hanging string, and a rosewood jikusaki with a machined end. My only concern with using this in a bonsai display is the trees in the painting will interfere with the near/far perspective of the viewer. The bonsai should set the near perspective and Fuji should indicate the far distance. This scroll is for sale. It is written in a Semi-Cursive style by Yoshimi "Ryugyoku" Yamada. The total scroll size is about 1.5 feet wide by 3.5 feet long. It is made with a solid Shike cloth that has a silver tint. It was framed in an informal style called Fukuro Hyougu. It is finished with an ivory pvc jikusaki, and a nezumi, light gray hanging string. 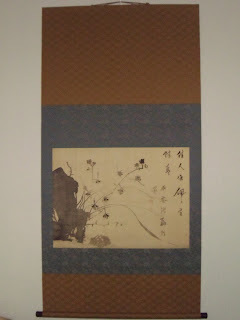 It was sent to me by a bonsai artist that had purchased this scroll. He had hired quite a few people to reframe it...but when it was sent to me it only had a heat based back paper and the original Ichimonji attached to the cloth. I redid the scroll. Removing foxing is still a skill I need to learn. Hopefully, when I go back this summer, I can take the time to learn it besides some other things. In designing the scroll, the only character's in the calligraphy my wife could decipher was, Okuyama (Far Mountains). I also could not find a Japanese tale involving a bear and a crab. There is a tale from Aesop about a hungry bear and crab....So I selected the wave pattern Chuumawashi to represent the beach where the crab resides. I used the mountain motif in the Ichimonji to represent the Okuyama from where the bear travelled. I used a sea green Ten and Chi to reinforce the ocean. The kakehimo is the Sandai Koiro, and the Jikusaki I used were a black lacquer wood in case the owner wanted to display with a formal evergreen bonsai, particularly if it is styled in a formal styling. Mori Ippō was born and lived in Osaka. He was trained in the Shijō style by Mori Tetsuzan, who later adopted him into the renowned Mori family. In the 1850’s the executed a commission for the Imperial palace. Little information about his life is available, except what he noted down in the humorous book he wrote. His work shows no great genius, but it is good enough to deserve more acclaim than it generally receives. Recurring themes are animals, birds, landscapes, and scenes of Osaka life.